Today, we have author Cheryl Harrington sharing insights from her multi-act life. I wrote my first novel, The Mystery of the Nancy, while on vacation in Wasaga Beach, Ontario. I was twelve years old that summer and my first encounter with the remains of HM Schooner Nancy at a local museum had fired my imagination. In her glory days, The Nancy was a Great Lakes fur trading vessel. 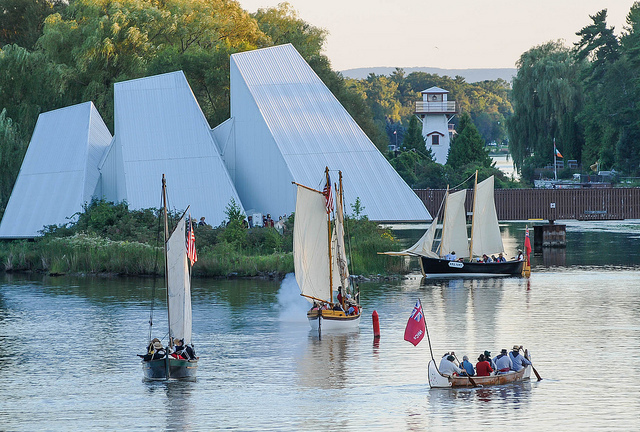 During the War of 1812, she sailed the lakes as a supply ship for the British. Captured and set afire by American forces in 1814, The Nancy sank in Lake Huron near the mouth of the Nottawasaga River. Over the years, an island formed around the wreck and, eventually, the remains of the schooner were raised and installed in a museum as centrepiece of a park that now bears her name: Nancy Island Historic Site. The old girl had reinvented herself, quite literally, from the ground up. I can’t think of a better tale than HMS Nancy’s to begin a guest post ‘On the Road to Reinvention’. Thanks for having me, Joanne! That first novel of mine, The Mystery of the Nancy, sparked in me a life-long love of words. It was published in a limited edition of one, in a tatty, blue-covered school notebook, and it met with rave reviews from early readers (Mom, Dad, and Grandma). Sadly, the work was left behind when we returned to the city but, as I recall, my story followed a young sleuth and her chipmunk sidekick as they investigated a mysterious theft from the HMS Nancy Museum. Storytelling is a powerful thing. Even now, fifty-three years later, I can close my eyes and enter the vast room where the bones of The Nancy rested, watch dust motes drifting in lazy arcs above her hull, and feel the heat of that long-ago summer afternoon. Yes, there is magic in words. Beyond my trusty journal, not much writing was done during those years. Farm and family kept me happily busy. And then… I met Anne Norman. Like me, Anne was a back-to-the-lander. We bonded over play dates with our kids, swapped produce – her goat’s milk for my brown, double-yolk hen’s eggs – and talked about books. One of those book talks morphed into a marathon “what-if” plotting session and our first co-authored book, ROCK SOLID was born. I’ve blogged about our co-writing process at stillpoint: The (co)Writing Life so won’t go into it here other than to say we had an awesome amount of fun. So much, in fact, we went on to write another book together, FAST FOCUS. After years of polishing, submitting, rejections, and revisions, both novels were contracted and published by Avalon Books, a small New York publisher of hardcover library editions. Our shared success was a dream come true for us both. By this time, our children were grown, the city was rapidly advancing on our rural neighbourhood, and both Anne and I had left farm life behind. Eventually, we said farewell to the co-writing life, too, although we remained great friends and left the door open to working together on another book. Meanwhile, I knew I wanted to try my hand at writing solo. All I needed was a spark of inspiration. And then… I paid a visit to my dentist. While sitting the waiting room, nervously trying to distract myself from the drilling and filling to come, I picked up a magazine and was instantly captivated by the cover story. It was a first-person account of a wild fire, written by a young woman who’d spent her summer working as volunteer forest fire fighter. Inspiration struck and SPARKS FLY was born. Fond memories of camping and cottaging vacations in the north woods merged with my new fascination with floatplanes to bring the remote setting of Casey Lodge to life. I connected with a young bush pilot who’d flown in isolated locations from northern Canada to Africa and revelled in the romance of flying (and the not-so-romantic reality of roughing it alone in the wilderness). I met with a young geologist and picked her brain about the summer she spent working for a mining company near Red Lake in Ontario’s far north. Her stories of surviving a major forest fire helped me write authentically about fire and about life in the north. During the writing, my family gave me the ultimate birthday gift: a flying lesson. I was terrified! It was an awesome, unforgettable experience and you can share it with me at stillpoint: Writing Wings. Would I do it again? I get the trembles just thinking about it. But yes, absolutely! SPARKS FLY was originally published in hard cover by Avalon Books for their library program. In the summer of 2013, the Avalon backlist was sold to Amazon Publishing and over the following months, SPARKS FLY, FAST FOCUS, and ROCK SOLID were re-released under the Montlake Romance imprint. All three are now available for Kindle and in paperback and hardcover formats. I’m delighted to see our stories live on for new readers to discover. In April of this year, I retired from my day job with great expectations for a new and exciting chapter of life. For me, the best part of retirement has been the luxury of time to focus on writing again. I’m working on another sweet romance, set in coastal British Columbia and featuring an independent young woman who’s faced with difficult choices when her beloved grandfather suffers a debilitating stroke. Also in the works is a cozy mystery with a surprising paranormal twist. I knew I was on the right track with this one when the characters ignored my ideas and took their story in a strange and unexpected new direction. And the magic is back! What’s next? I don’t know. But I’m excited to find out. Stay tuned for Act Five! What happens when a thoroughly modern woman, who longs to return to her roots, meets an old-fashioned hero on her first day home? Sparks Fly. And it doesn’t take a forest fire, smoldering in the distance, to turn up the heat between high school science teacher, Logan Paris, and bush pilot, Mitchell Walker. Logan’s dream of a bright future for her grandfather’s lodge at remote Thembi Lake hits an unexpected snag when Gramps introduces the handsome pilot as his new partner. It seems that Mitch has plans of his own for Casey Lodge, and Logan is certain they don’t include partnership with a “city girl”. Determined to prove herself and protect her heritage, Logan sets out to unravel the many mysteries of Mitch Walker. Where did he come from? Why is Gramps so willing to trust him with their future? And most disturbing of all . . . what’s she going to do about the undeniable attraction she feels whenever he’s around? Rock Solid is a sweet romance about family, special needs, small town life, and environmental protection. Save the turtles! Fall in love in New York with Fast Focus – part romantic comedy, part cozy mystery…and Rufus the dog! 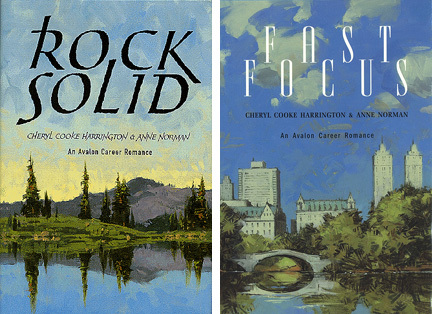 Cheryl Cooke Harrington is a Canadian author based in Toronto. Her novels have been published by Avalon Books (New York), Ulverscroft Press (London), and most recently by Amazon Books under their Montlake Romance imprint. Cheryl’s stories combine sweet romance with a hint of suspense and adventure. 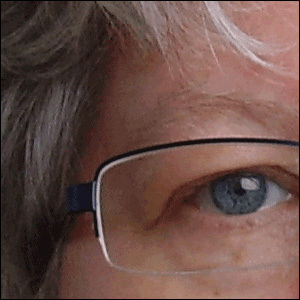 Recently retired from a 40-year career as office manager for a landscape architecture firm, she is currently writing another sweet romance and branching out into mystery – cozy with a twist. Between paragraphs, Cheryl serves as personal assistant to Sam the cat and Jazz the opinionated parakeet. Coffee/Tea and a Book: Winner will receive one copy of SPARKS FLY by Cheryl Cooke Harrington, winner’s choice of either autographed hard cover OR Kindle edition, PLUS a $5 Starbucks gift card. Giveaway starts June 26, 2015 at 12:00 AM EST and ends July 7, 2015 at 12:00 AM EST and is open to entries from the US, Canada, and the UK. One winner will be chosen at random via Rafflecopter and will have 48 hours to respond before a new winner is selected. 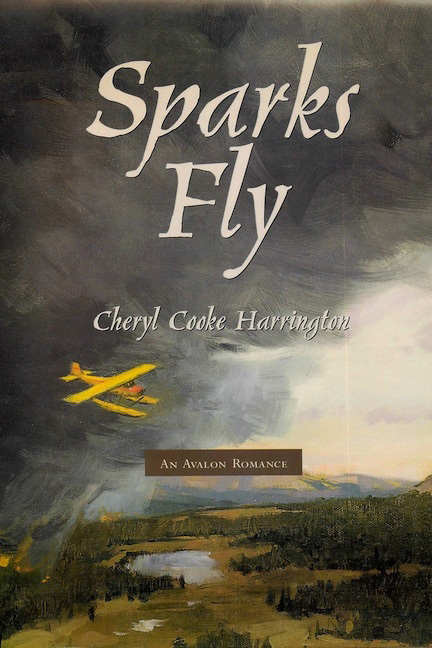 If the winner chooses to receive a print copy of SPARKS FLY, Cheryl Cooke Harrington will send the prize to the winner directly via postal mail. (NOTE: The book will be mailed from Canada on the next business day after receiving winner’s mailing address. Depending on winner’s location, mail delivery may take several weeks or longer.) The prizes offered for this giveaway are free of charge, no purchase necessary. Facebook and Twitter are in no way associated with this giveaway. By providing your information in this form, you are providing your information to Cheryl Cooke Harrington alone. She will not share or sell information and will use any information only for the purpose of contacting the winner. Cheryl, thanks for sharing your inspiring journey. Best of luck with all your literary endeavors. This entry was posted in Guest Blogging, Inspiration, Second Acts and tagged Cheryl Harrington, Fast Focus, Joanne Guidoccio, Rock Solid, Sparks Fly. Bookmark the permalink. Cheryl, I loved hearing about your writing journey. I think, as writers, we all have to learn to balance our writing with the living that gives us the material for our stories. Thanks for sharing. So true, Sandra – and it’s not always easy, is it? Definitely worth the effort, though. Thanks for stopping by to read! I feel so darn special, I have to tell you. Your writing touches people and makes them think, as well. Happy new trails, now that you’re on your way to further greatness! I’m pretty sure I recognize Ms. “Anonymous” as my friend and former co-writer, Anne Norman. Very sweet of you to say, Anne. Happy trails to you, too, and good luck with your writing! Cheryl, I totally agree with you about writers who set aside their dreams because life gets in the way. Thanks for sharing yours. There’s always something, isn’t there, Loretta? Thanks for reading!